One week from today is Thanksgiving in the United States, a holiday which we celebrate by gathering together, sharing food, and saying thanks. This year, I’ve got a lot to be thankful for, because you’ve helped Word Horde succeed in its most ambitious year yet. We published five books this year: Molly Tanzer’s weird western, Vermilion; Nicole Cushing’s ultra-dark delve, Mr. Suicide; Orrin Grey’s captivating collection, Painted Monsters & Other Strange Beasts, and the anthologies Giallo Fantastique and Cthulhu Fhtagn! So, to celebrate this success, and to give back, I’ve decided it’s time for The Return of #FeedCthulhu. 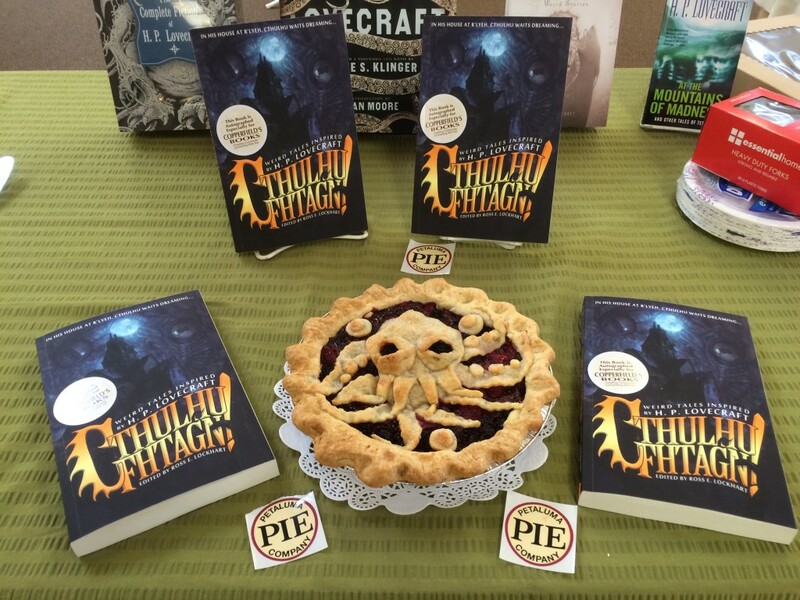 In 2011, when my first anthology, The Book of Cthulhu, was published, I challenged readers to make a donation to a local food charity, and to share news of that donation on Twitter, using the hashtag #FeedCthulhu. That year, we raised several hundred dollars in pledges across the country to local food banks and homeless shelters. In 2012, to accompany the publication of The Book of Cthulhu 2, we repeated the challenge, raising over a thousand dollars worth of pledges. Don’t forget to include the hashtag (#FeedCthulhu) and my Twitter handle (@lossrockhart) so that I can see–and share–your post. Also, if you send a link to your post via email to publicity[at]wordhorde[dot]com, in return for your generosity, I’ll send you the ebook of my latest anthology, Cthulhu Fhtagn!. Just let me know if you’d prefer ePub, mobi, or PDF format. I’ll be checking social media for the hashtag, and on December 1, I’ll be selecting three random posters, who will receive a personalized autographed copy of Cthulhu Fhtagn! And for dessert, I’d also like to say thanks to you by making you a special offer. Place an order with Word Horde between now and the end of November, use the coupon code THANKS, and take 20% off your purchase. It’s our way of saying “Thank you!” for a great year, and encouraging you to give Word Horde books to your cool friends this holiday season.